Wife - "I just don't think you have a very high tolerance for pain." Husband - "Yeah I do. I had hip surgery. You've never gone through anything like that. The only thing you've gone through that you could maybe compare it to would be child birth....I guess." #2 Retirement can make you do some funny things. My father in law retired back in October and like many new retirees, he's been enjoying it to the hilt. He travels, goes out to breakfast with the guys, and takes naps when he wants. But lately there have been signs that perhaps he's getting a little bored. He decided to try baking......a cake......just to see..... if he could. This was the picture hubby sent me at work.....as you can see it was not just a cake, but a 3 layer cake. Let me make this clear......he made 3 separate cake mixes and then made one HUGE cake out of it. 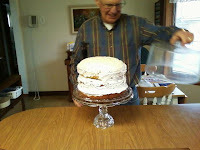 It was so big that he didn't have enough frosting for it. He had to use cool whip for the bottom half and then the homemade, (yes, he also made his own frosting) cream cheese, frosting on the top layer. It fed 9 of us and there was still half a cake left!! We're pushing for him to find a job......and soon! #3 Everyone should have a Kevin Costner as their friend. As most people know by now, Whitney Houston's funeral was yesterday. I viewed a small portion of the ceremony, in particular, Kevin Costner's extremely moving tribute. He spoke, not as a movie star, but as someone struggling to hold it together at the funeral of a dear friend. Kevin's story was touching and yet heartbreaking. Some might even say, it was a little unkind to tell. It wasn't bad enough that Whitney is gone, now someone is standing in front of the world telling a story that highlights her flaw of being seriously insecure. At the height of her career, being one of the most popular celebrities in the world, she felt she wasn't pretty enough to pass a screen test. It spoke volumes about how fragile her psyche must have been. I actually think that story alone, was one of the only "true" stories that have been told since her passing. I think Kevin knew very well what he was doing in telling that particular story. He was humanizing her. He said to the world that in spite of all the accolades, awards, money and fame, Whitney was a person, who could be just as scared and full of self doubt as the next person. The demons that we all face were no stranger to her. Perhaps because of her fame and the pressure she felt, they overwhelmed her even more. Perhaps the drugs and alcohol were an attempt to combat the demons and insecurities that she faced. From the outside, we saw a beautiful woman with an even more beautiful voice. For Whitney, she saw someone for whom there was never enough makeup to cover her imperfections. I've heard and read a number of comments about Whitney this week. Some were kind, expressing sorrow at the loss of such an amazing voice and memories of the joy her music had brought. But too many of them were jokes made regarding her drug addiction and erratic behavior in the later years of her career. I think it's easy to forget sometimes that celebrities are human too. Yes she was Whitney Houston, big singer and movie star. But she was also some one's daughter, some one's niece, and some one's mother. To Kevin Costner she was a friend, and he had no shame in telling this to the world. Beautifully said Adrienne! I've said many times, the easier our gifts come to us the more we ignore them. Whitney was no different than anyone else in that regard. Always second guessing and insecure in her own amazing talent. I can see how, in the spotlight all the time, it would be amplified so far that drugs and alcohol became an escape. Not an excuse but an escape from her own insecurities. She was quite human indeed. I wouldn't worry about your father in law... maybe he can find a 2nd career as a baker! @ Barbara - Whitney was my first concert and I was always amazed by the strength of her voice. I was blown away by Kevin Costner's speech - it was one of few honest moments of sadness that I've seen expressed. I'm sure he was just as distraught as anyone over the drugs and alcohol, but I think more than anything he wanted to just make her human for everyone, to drown out all the other "stories" being told. In telling that story it was so easy for me to see how sad she must have been. I have my days when I feel too fat, too un-pretty, too everything and I feel depressed. Add the glare of the lights and millions of eyes on your every move, one can easily imagine how this poor woman got to the point she had gotten to. You are right...the jokes are cruel. Even when she made the now infamous "crack is whack" comment I wanted the Whitney we all fell in love with to make it back. It still saddens me to know she never did. LOL @Father-in-law. I am impressed!